Includes foot spa, hard skin removal, nail tidy and foot massage. You get the nail polish bottle with you after the pedicure. Includes: foot bath, exfoliating scrub, mask, nail tidy and polish, foot massage, revitalizing gel and silky-smooth moisturizer. A luxurious and indulgent treatment for feet. Includes a foot bath, exfoliation, a foot mask and foot cream. Refreshes tired feet and moisturizes the skin. In conjunction with pedicure 30 min 30 € The gel treatment makes your toenails beautiful and easy to care for. The overlays last about 4 weeks. Beautiful and durable (2 weeks) UV-cured gel polish. Various colours. French gel nail polish 50 €, the removal of the old ones and putting the new ones 60 €. Includes hail filing, cuticle treatment, hand exfoliation and massage, and nail varnishing. Includes: exfoliation, moisturising, light massage and paraffin. Includes footbath, nail trimming (and varnishing) and a light, relaxing foot massage. 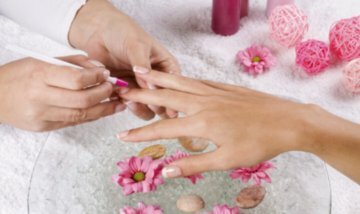 Includes nail trimming (and varnishing) and a light, relaxing hand massage.